Today, FLO TV unveiled their highly anticipated "FLO TV Personal Television". 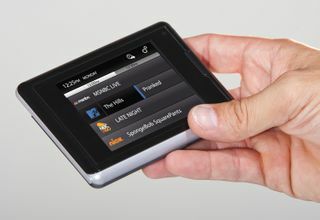 A portable 3.5" touch-screen device with built-in stereo speakers that will let consumers take their TV with them on the go. The device will be available this holiday season with a suggested retail price of $249 plus at least $8.99 a month in FLO TV subscription fees. It measures 4.4 inches by 3 inches, is only half an inch thick and weighs just over 5 ounces. The company says it has a battery life of more than 5 hours of TV viewing or 300 hours on standby. Bill Stone, President of FLO TV will be our keynote speaker on November 17th at the Streaming Media West show in San Jose and will have the Personal Television with him for viewing. All keynotes are free to attend, so register now for a free exhibit pass and come get hands-on with the device.